At the market the other day I bought a fruit called a “black heart”, which I’ve never seen anywhere outside of the Azores and is sugary and delicious. I generously offered a piece to Magnus, but he just sniffed it and told me it smelled like barf. Oh well, more for me. 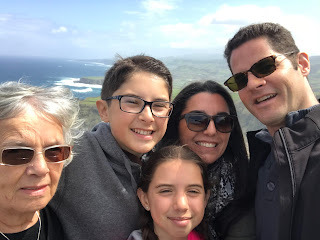 Today we had plans to hang out with Tia Ana, so we picked her up at around 9:30 and we drove north across the island to the Gorreana tea factory, which is east of Ribeira Grande. One of the most popular fun facts about the Azores is that it’s the only place in Europe where tea is grown commercially. Another fun fact is that there’s a 98% chance of meeting somebody who has an uncle in Cambridge, Ontario. The self-guided tour at the tea factory was worthwhile, and I did learn a few things about tea. It seems that there are three different varieties of leaves on a tea bush, and these are separated out at the end of the process to make different varieties of tea. The interesting part was that green tea is made simply by using all three types of leaves. They used machines to mash the liquid out of the leaves, spin them around, oxidize them, dry them and then transport them to the sorting room. The crazy part is that in the sorting room there were five women sitting around a table sorting out the different varieties of tiny, dried-up leaves by hand. And some of these leaves were the size of small ants. It made me appreciate the complimentary cup of tea we received at the end of the tour much more than I otherwise would have. A young lad of about 20 years of age gave us an hour long personal tour and told us everything there was to tell about the company and the tobacco making business on Sao Miguel. He showed us a series of diesel powered or manually powered machines that turned raw tobacco into cigarettes, as well as two huge barns used for drying the green leaves and a massive weigh scale used to weigh the raw product brought in by the farmers. I asked the tour guide if the kids got a complementary smoke at the end of the tour, but he didn’t really laugh so maybe he just thought I was a bad parent. In the tobacco factory was a large map of the region showing other sites of interest and one of these was called Termas das Madeira Velha - a hot spring, and we do love our hot springs. After a long, winding, and extremely steep road we found it, but an initial inspection suggested it was not a hike that Tia Ana would be able to manage that easily, so we gave it a miss and instead headed into Ribeira Grande for lunch, after which she was ready to call it a day so we drove her back home and then headed back to the hot spring for a hike. At the head of the trail there was a sign that said “500 metres —>” which didn’t sound too bad until we got three minutes into the walk and realized that the 500 metres must have been referring to the vertical drop of the path - a series of steps and steep declines leading right down to the foaming, crashing sea. We made it down in about 20 minutes to find a magical, medieval, mystical pool of piping hot and crystal clear mineral water. Yah, just kidding - it was a total wreck. There was an old concrete spa there, but the trickle of water flowing into it was lukewarm and the pool itself was full of green slime, chunks of plastic, and probably large conventions of waterborne viruses. At one time through, it must have been remarkable, as there were also the ruins of a large bathhouse with change rooms and toilets. I wonder if the water simply somehow ran out of heat and ruined the whole project? Or maybe too many people had heart attacks on the way back up the hill. The hike back was a tough slog, particularly for the older contingent of the family. Stella led the way the entire time, practically running up the steps of the path, proving true her Viking nickname “Stella Strong Legs”. After this bit of sloppy hiking, the Viking nicknames for us should be “Ana Thin Lung” and “Kristof the Wheeze”. We took the long route home, thinking we might stop for a swim at one of the most famous hot springs on the island, called Caldeira Velha, but as we made our approach to the entrance we found an endless string of parked vehicles and even a couple of large tour busses, with people everywhere. Moreover, they had constructed a large gate at the entrance and you now had to pay to get in. The last time we were here, there existed just a simple dirt trail leading to a magnificent hot waterfall that collected in a large swimming hole, and there were only a few other people there. It seems tourism has picked up a bit. Continuing along the same winding, steep road we first passed by the big geothermal power plant that supplies nearly 80% of the electricity to the island, and that’s nearly zero carbon emission electricity. We continued climbing right to the top of this extinct volcano whose crater is home to Lagoa do Fogo (Lake of Fire). The likelihood of actually seeing the lake is very low, as it is normally dense with fog and clouds, but today we got lucky and were able to see the lake clearly - stunningly beautiful. If we weren’t so wiped from our previous hike we might have done the hour-long hike down into the crater to see the beach on the lake and maybe even go for a swim, but that will have to wait until our next trip. This drive up to Lagoa do Fogo was the first moment on our vacation that we’ve seen any evidence of increased tourism on the island, despite having been told that tourism had exploded in recent years. Saying that, we are here during a shoulder season, so I expect it does get much busier during the summer months. To finish off our day trip, we drove back to the beach Praia Populo for a sundowner drink and a nice long chat while the kids explored the rocky shoreline looking for crabs. We talked about our land, and the reasons for and against building something now. Unless we were planning on moving here, we decided it didn’t make sense to have a home here. Yes, we could use it primarily as a B&B rental and probably make a little bit of money. But that would mean an additional amount of administration and headaches - something we’ve quite purposely tried to get away from in recent years. Also, that would mean that our vacations to the Azores would turn into maintenance trips, where we’d spent the entire time working on the property, fixing up all the scratches and dents. Why do this when we can easily rent houses here or stay with family? A much better fit for us will be to have a slip in the marina in Ponta Delgada, where we can sail here for the summer months and be located right downtown. But that, my friends, is a plan for the future. We finished the day with an epic soccer match in the park - parents versus kids. We let them win 10 to 9.